I don't always take my food photographs in traditional locations. Sure, I have plenty of photos taken in the kitchen or dining room, but I have just as many taken elsewhere. My motto is to follow the light—when the light isn't in the kitchen, I pack up my equipment and move. I've taken photos on the laundry room floor, the ledge of a floor heater, and many more on top of the dryer... No place is safe from my camera lens. This spritzer posed a unique challenge. Light flooded every room in the house which left me with many options. I initially set up for the photo shoot on the dining room table. Napkins and garnishes covered the table to offset the drink, but the photos were dull and uninspiring. I moved to the side table in the living room. The window curtains were reflecting in the glass. I moved to the bedroom. It was even worse. After moving to four separate locations, I was ready to throw in the towel (or napkin, as it may be). But then I was hit with an idea. A wonderful, awful idea. Barefoot in the snow on the deck, I snapped these photos. And it worked. I love it when it works. This cranberry white wine spritzer is bubbly, fizzy, and just plain good. The cranberry syrup is tart and tangy but, when combined with the wine and the soda, the whole mixture become light and sweet. This cocktail is perfect for dinner parties, sharing with friends, or when you simply want a little pick-me-up at the end of the day. Chill the syrup, wine, and soda prior. 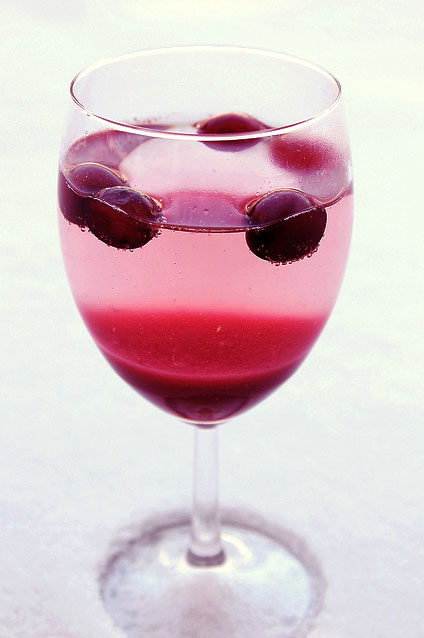 Place the cranberry syrup in the bottom of a wine glass. Delicately pour the white wine and lemon-lime soda into the glass, trying not to disturb the cranberry syrup layer. Garnish with extra cranberries and serve chilled! In a medium saucepan, bring cranberries, sugar, and water to a boil over medium high heat. Reduce the heat to medium-low and cook until all of the cranberries have burst, about 15 minutes. Allow the cranberries to cool down and then strain through a fine-mesh sieve. Do not force the cranberries through the sieve or you will end up with particles in your syrup (and then particles floating about in your drink). Discard the cranberries. Refrigerate the syrup in an airtight container for up to 2 weeks.